This awesome lace and chiffon dresses is figure-flattering and perfect for any upcoming party or social event. It is one of our favorites! The Merry Engagement Lace and Chiffon Dress is fully lined, except at the sleeves, which are semi-sheer. The top is made of floral lace and has a V-neckline, short sleeves, and banded empire waist. The attached skirt is made of chiffon and has a flowy cut. An exposed back zipper completes this dress. The Merry Engagement Lce and Chiffon Dress would look perfect paired with pumps or strappy heels and some pretty jewelry for any upcoming party or event. Details: Made in USA. Lined. Exposed back zipper. 100% polyester. Hand wash cold or dry clean. Small measurements: Length from top of shoulder to hemline: 35". Bust: 32". 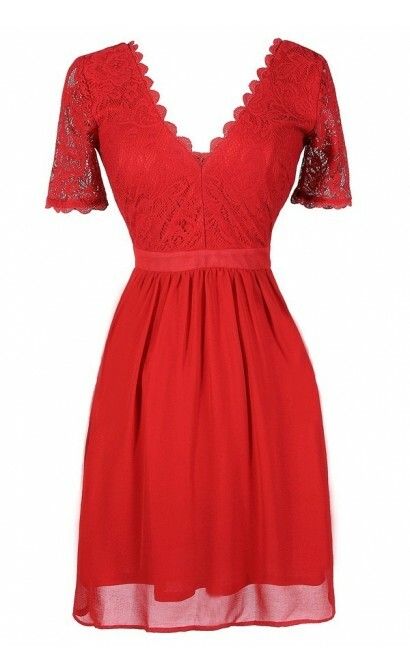 You have added Merry Engagement Lace and Chiffon Dress in Red into Wishlist. 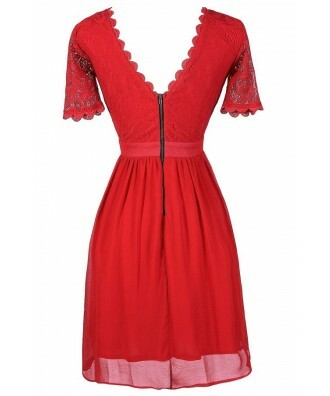 You have added Merry Engagement Lace and Chiffon Dress in Red for Stock Notification. 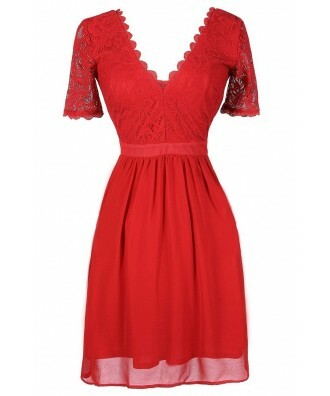 You have set Merry Engagement Lace and Chiffon Dress in Red as a loved product. 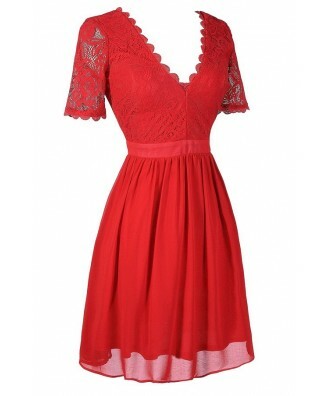 You have removed Merry Engagement Lace and Chiffon Dress in Red as a loved product.